What do words reveal? How do you describe the pain — the sheer anxiety — of getting those words from brain to paper to the streets? What do you do in that uncertain space between publication and the Next Great Idea? 31 Canadian writers talk inspiration, desire and breaking the rules in anthology Finding The Words. Words — the act of writing them, the art of using them, the slog of selling them — are the focus, and no two writers approach the topic in the same way. There are journalists, such as the fifth estate’s Linden MacIntyre, the Globe and Mail‘s Stephanie Nolan and freelancer Richard Poplak. There are plenty of novelists, including Alice Munroe, Pasha Malla and David Chariandy. There are also poets and filmmakers and songwriters. The result? A “radical revision” in the author-reader relationship, where the traditional gap between the two all but disappears, Kay writes. Now, readers have been seen attacking writers online for late deliveries of manuscripts, or chastising them for taking holidays (which they knew about because the authors broadcast these life details on their blogs and Twitter accounts). Because “the jury is still out as to how much this self-exposure helps a book right now,” the important thing, Kay stresses, is that writers calculate what the time and effort is worth to them. Finding the Words also includes essays about the less tangible aspects of writing, about fears and anxiety and pressure. Annabel Lyon writes about coming to understand a character she previously despised; fifth estate co-host and Giller Prize winner Linden MacIntyre writes about the hidden potential of mediocrity. In a similar vein, author, poet and magazine writer Steven Heighton writes about the lost art of boredom: “The minute I get bored now I check my e-mail…And if there’s nothing there, there’s the internet. For almost all of my writer friends it’s the same: like me, they constantly, casually lateralize into the digital realm. My favourite essay was the piece by writer and journalist Stacey May Fowles about discovering the unexpected anxiety of publication. Her post-first-novel state quickly disintegrated from jubilant to inextricably housebound, and she found herself unable to cope with most everyday tasks. She didn’t expect to “fall apart so dramatically” when her first book hit the shelves. What Fowles found most disturbing is that absolutely no one told her it was coming. “I do think there’s something to be said about the tendency of first-time novelists to conceal the emotional consequences of publication from the naive scribes that follow in their footsteps,” Fowles writes. She admits that she, too is guilty of this: in the midst of her struggle, she told a class of high school students how wonderful it was to be a writer. 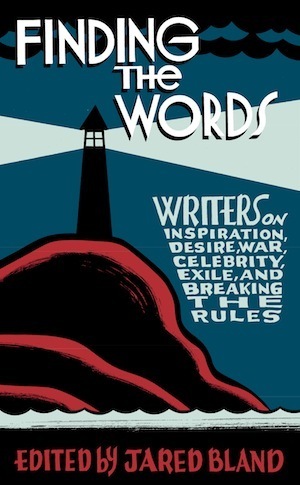 In this introduction to Finding the Words, Bland writes that “While we use language every day — sometimes gloriously, sometimes frivolously — we cannot forget that being able to do so is an essential right that must be defended.” All sale proceeds go directly to PEN Canada, an organization that fights for freedom of expression. All of the writers donated their work to the book, publisher McClelland & Stewart contributed warehousing and shipping costs and Friesens discounted its printing services. If that — along with the promise of inspiration and you’re-not-alone reassurance — isn’t enough to pick up this book, why not simply judge it by its cover? Cartoonist Seth (of Walrus and New Yorker cover fame) designed and illustrated it in a beautiful and simple old-school style. Between the covers, you’ll find a lot of reasons to keep searching for those words. For the list lovers out there, authors Pasha Malla and Moez Surani offered a crowdsourced list of writerly ethics. Their readers’ suggestions included: rule 21: Don’t live voyeuristically, seeing every human interaction as a potential source for sport. Rule 45. Don’t start drinking before noon. 47. Read more than you write. Other ethical advice included the contradictory “always speak the truth. Even in fiction” and “never let the truth get in the way of a good story” and “never let a good story get in the way of the truth” and “be true to yourself”. Which ones are you guilty of breaking? To borrow a phrase from Canuck magazine writer Chris Jones, Finding the Words is not all Smurfs and sunshine. This story was originally published on J-Source. This entry was posted in Articles, Reviews and tagged Book review, canlit, finding the words. Bookmark the permalink.